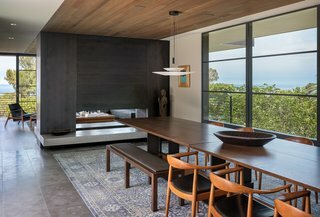 Lucas Design Associates and Graham Architecture renovate a 1961 midcentury in Laguna Beach, imbuing it with a rich, layered atmosphere that showcases the owners’ antique collection. 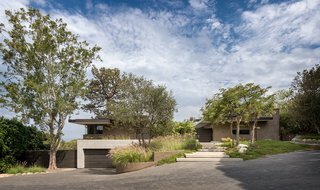 Perched	on	the	coastline	and	surrounded	by	lush	greenery, Kevin and Holly Johnson’s home	in	the	Woods	Cove	neighborhood	of	Laguna	Beach,	California, was built	in	1961	and	designed	by	noted midcentury architect	J.	Herbert	Brownell. 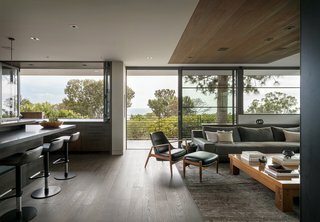 The	two-story residence sits on a half-acre, wooded parcel that was once part of a botanical garden and enjoys a stunning panoramic view of the ocean. 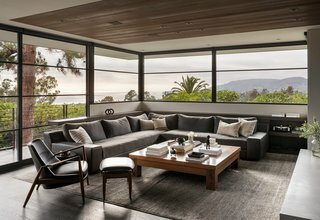 Lovers of modernist architecture, the Johnsons reached out to Lucas	Design	Associates	(LDA)	and	Graham	Architecture to	renovate their property—tasking them with not only updating their home, but also infusing it with Japanese influences suited to the midcentury property. 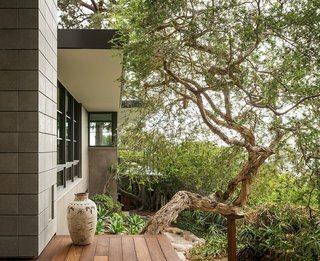 They also wanted the home to embrace indoor/outdoor	living, reflecting their love	of	nature and the beautiful surroundings. 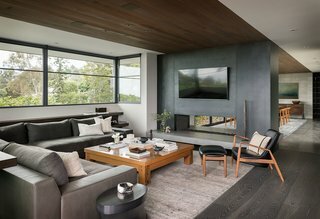 LDA	and	Graham	Architecture's approach to Woods Cove Retreat was to honor	the	character	of	the original structure	while	focusing on maintaining privacy	and	functionality	for	this	busy	family	of	four. 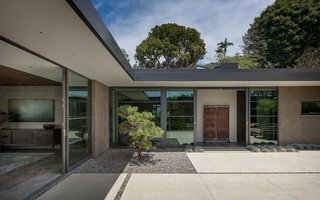 Visits	to	the	Schindler House	and the Eames	House provided	inspiration	for	the design of the remodel	and	helped show "how a modest	scale	can	be	both	interesting	and	impactful." 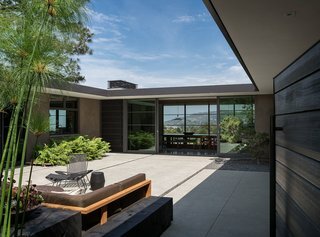 In fact, many	of	the	tenets	of	the	Schindler	Frame	were	embraced	and	adopted by the architects: floor-to-ceiling	ribbon	windows,	a	clerestory,	large	overhangs, and a low	horizontal	profile with	varying	ceiling	heights. The grand entrance to Woods Cove Retreat welcomes the homeowners and guests. 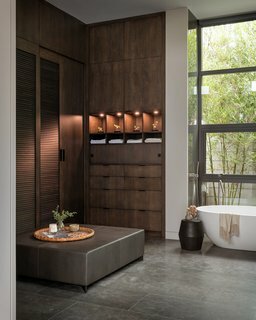 The	residence features a diverse material palette that is somewhat unexpected for a Southern Californian home, starting with the shou sugi ban gate. Full of rich, multi-layered textures, the darker shade gives the home a subdued, Japanese vibe, and provides the perfect backdrop for the Johnsons to showcase their collection of antiques. 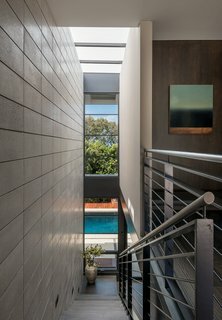 Sliding doors enable seamless indoor/outdoor living. 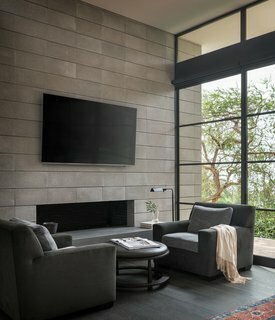 Stained oak	floors	and	cabinetry, burnished	concrete	block,	custom	back-painted	glass,	a	Cor-Ten	steel	fireplace, and shou	sugi	ban wood all appear throughout the home. 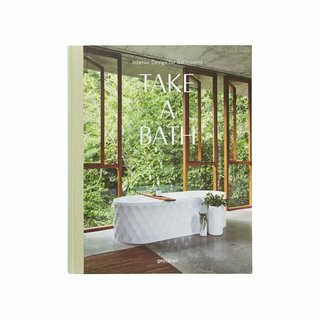 "We	focused	on	integrating	nature-inspired	elements	and	modern	accents	in	order	to	create	a	retreat	for	our	clients,	a	sort	of	safe	sanctuary	immersed	in	a	picturesque	landscape,"	explains David Lucas, LDA founding partner and creative director. "Now	they	have	a	space	that	they	can	enjoy that	reflects their	passions	and their life." 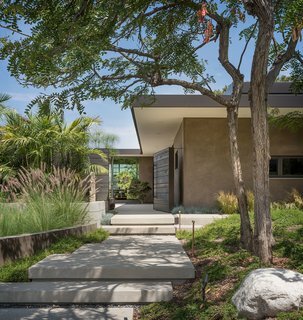 A quiet moment of light and shadow highlights the home's Japanese influence. 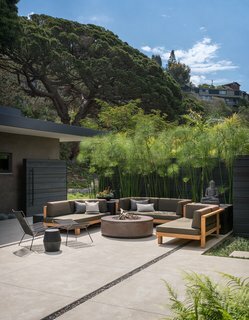 A concrete fire pit on the outdoor patio provides a place for outdoor entertaining, with ample space kept open for spontaneous dance parties. The sofa is from Henry Hall's Tru/Pure collection with fabric from Christian Liaigre and McGuire. 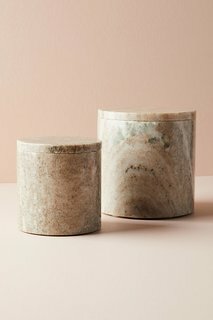 The Tekka side table is from Christian Liaigre. An Allan Gould midcentury modern iron-and-rope lounge chair and ottoman complete the scene. 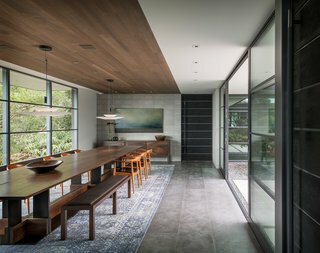 The	clients' passion	for	hosting	family-style	gatherings guided	the	design	of	a	custom, 20-seat walnut dining	room	table from Meyer Wells paired with Hans Wegner chairs. The hemlock ceiling helps define the space. The Vibia Flamingo 1540 pendants are from Antonie Arola. The custom, modern farmhouse credenza is from Chadhaus, and the artwork is by Wolfgang Bloch. A dual-sided, Cor-Ten steel fireplace serves as a divider between the open-plan dining room and the living room. On the other side of the Cor-Ten fireplace is the living room. The custom Augustin sectional and the cocktail table are from Christian Liaigre, and paired with Ib Kofod-Larsen's Seal chair and ottoman. Floor-to-ceiling windows frame the stunning, panoramic view. The kitchen sits just off the living room area for easy entertaining. The roller shades are from J Geiger. 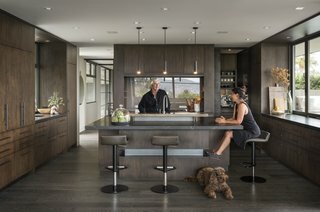 The homeowners take a seat at the island of their kitchen. The kitchen features custom-stained, white oak cabinetry and honed granite countertops—plus plenty of storage. 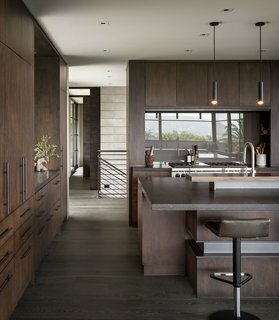 The kitchen barstools are from Ligne Roset. Vintage, Jacques Biny black enameled metal pendants from the 1960s maintain a retro feel. The	existing	footprint	and	scale	of	spaces was reworked to suit the clients’ specific	needs. 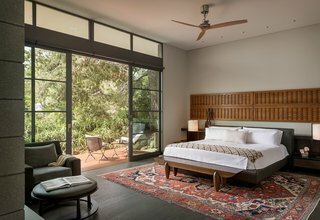 This included converting	the	indoor	pool	pavilion,	which	wasn’t	in use,	into	a	spacious and light-filled	master	bedroom	suite. The clients’ eclectic collection of antiques made for interesting vignettes rich with form and texture. 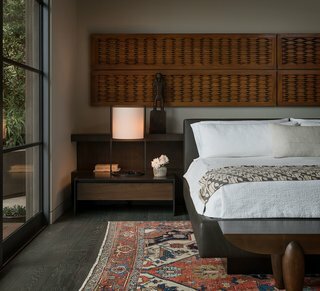 They are integrated along with new pieces, such as the Pirogue bench from Christian Liaigre and a custom nightstand from Meyer Wells. A sitting area in the bedroom features Christian Liaigre Album chairs with Kravet fabric on the body and Castel fabric on the cushions. The floor lamp is from Leflar and the roller shaders are from J Geiger. The exterior is surrounded by lush greenery. 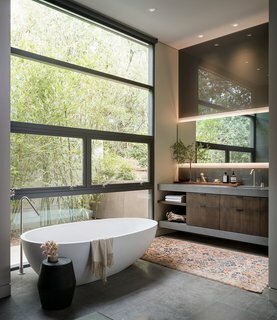 The master bath is complete with a deep soaking Agape Spoon XL bathtub. The outdoor area is enclosed for privacy, enabling the extensive glazing. J Geiger roller shades offer additional seclusion. Look no further for the ultimate skin softening and hydrating bath. 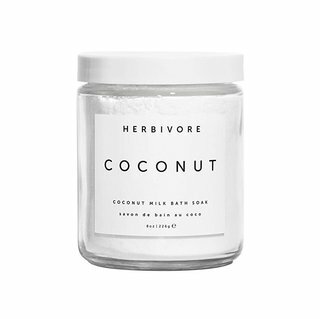 Deeply hydrating organic coconut milk is the basis of this luxurious and indulgent bath soak. Leaves skin moisturized and silky-soft. Truly Natural. Vegan. A simple, chic way to store everything from cotton pads to keys. Available in two sizes. 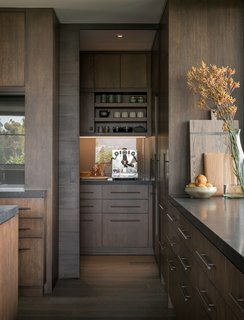 Dark oak cabinetry provides plenty of storage. Kevin scoured high and low for this 1956 Quadreflex mono speaker designed by Charles and Ray Eames for Stephens Tru-Sonic. 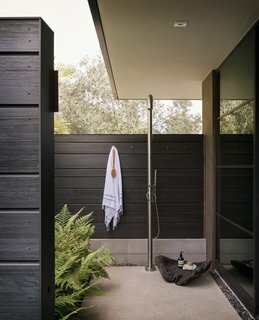 A serene outdoor shower space is surrounded by shou sugi ban wood. Stairs lead down to the pool. 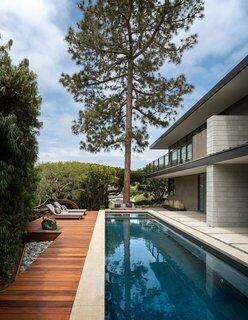 A tall tree perfectly aligns with the lap pool. The pool furniture is from Modernica's case study line.